There will be a time, hopefully, when scholars, theorists and music fans will no longer have to argue for the validity and cultural significance of hip-hop. And hopefully, a hip-hop theory course at Harvard University will one day cease to be such a thing of excitement, such an anomaly, that it would require and inspire a documentary like The Hip-Hop Fellow. But for the time being, rap and academia are still getting acquainted with one another. Although many academics have seen the theoretical depth in rap music for years—like Gwendolyn D. Pough who wrote Check It While I Wreck It back in 2004 and Tricia Rose, author of Black Noise—many are still just catching on. 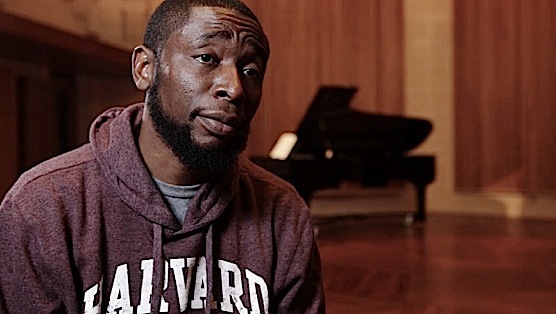 But not to worry—Grammy Award-winning producer 9th Wonder (AKA Patrick Douthit) is working toward creating a new generation of hip-hop theorists through his lectures and research as a recently tenured professor at Harvard University. Emmy Award-winning documentary filmmaker Kenneth Price delves back into a familiar world (he directed The Wonder Years with 9th Wonder in 2011) to bring us the story of a producer-turned-professor, and the hip-hop enlightenment coming to the Ivy Leagues. The Hip-Hop Fellow starts out as a profile of sorts on 9th Wonder. After working with everyone from Destiny’s Child to Ludacris and Jay Z, he found himself led to teach, with positions at both Duke University and Harvard. For a whole year, he flew between North Carolina and Boston to teach at both places, but the documentary focuses on his time teaching “The Standards of Hip-Hop” at Harvard, while also working on his own thesis project. The opening scenes also introduce us to Harvard’s Hip-Hop Archives, run by Marcyliena Morgan and renowned critic and African-American scholar Henry Louis Gates Jr.
It’s not that Douthit’s backstory isn’t a fascinating subject, and this introductory portion is indeed necessary, but the documentary really starts to take off when it branches out and begins to feel more like one of the producer’s Harvard courses. Viewers are schooled on the art of the sample—and you will walk away understanding it as a true art form. Producer Young Guru explains the artistry behind creating a song with multiple samples and influences. These are described as sound sources, and so sampling also creates lineage and a history that you can trace back to soul music, gospel, blues, rock and other genres. 9th Wonder likens it to a collage hanging in a fine art museum, while Henry Louis Gates (who started out in literary criticism) aligns rap producers with Formalist critics. He argues that sampling is to hip-hop what signifying is to literature. If we see intertextuality as an art form (as high literary art), then we must understand sampling in this way as well. Defining hip-hop albums (like Dr. Dre’s The Chronic, Nas’s Illmatic, and Jay Z’s The Blueprint) also become focal points, where 9th Wonder and others (Kendrick Lamar, Ab-Soul and DJ Premier) offer commentary and personal stories about the impact of these works. Price’s second documentary falls into some clichés, and one wishes he could have gotten a little more creative with the interviews and given them an atypical bent. The Hip-Hop Fellow distinguishes itself from other films about rap like Ice T’s Something From Nothing: The Art of Rap, which was primarily concerned with the lyricist, by being more concerned with production and also the political, social, and historical climates that brought about hip-hop music. Still, where Ice T’s interviews were intimate (perhaps, in part, because he was a fellow rapper), Price’s feel a bit bland. Where The Hip-Hop Fellow brilliantly veers away from the cliché is in its willingness to critique the very subject and movement it celebrates. Multiple interviewees comment on the problematical nature of hip-hop entering the academic sphere often through people who are not necessarily “of the culture.” 9th wonder himself takes issue with the fact that this highly important Hip-Hop Archive is at Harvard instead of a Historically Black College or University. Ultimately, The Hip-Hop Fellow is an exciting look into the future. 9th Wonder is appropriately named, as one of a few in his field who is both “of the culture” and, now, of academia. His story and Price’s story of a burgeoning world of hip-hop theory play like the coolest college course you never took. A few years from now it would be great to see Price check back in on the Hip-Hop fellow, or find a new subject to keep audiences abreast of in the ever-changing state of rap culture and music in the intellectual sphere. Shannon M. Houston is a New York-based freelance writer, regular contributor to Paste, and occasional contributor to the human race via little squishy babies. You can follow her on Twitter.